HomeFootballA College Started a Tackle Football Team. For Little Guys. A College Started a Tackle Football Team. For Little Guys. 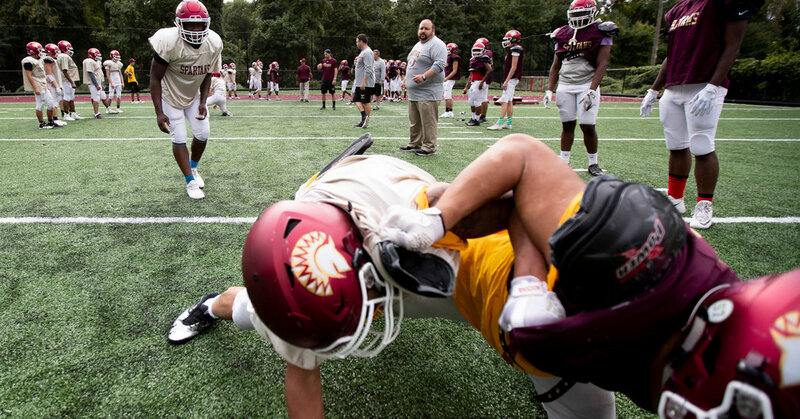 SPARKILL, N.Y. — In much of the United States, this is an era of disappearing tackle football programs. Tightening budgets and concerns about safety and liability have combined to spell the end of football at colleges like Hofstra in Hempstead, N.Y., and St. Mary’s College of California. Then there is St. Thomas Aquinas, a 65-year-old college founded by Dominican nuns, which is currently running a counter play. It started a football program this season instead of ending one. The move, part of a strategy to increase male enrollment, not really one to compete for gridiron glory, came with a wrinkle: At St. Thomas Aquinas, students would compete in sprint football, in which the players cannot weigh more than 178 pounds. There is blocking and tackling, and players wear helmets and shoulder pads, and the game has plenty of opportunity for injury. But in sprint football, punishing collisions between 300-pound linemen and 190-pound tailbacks cannot occur. The game is more about speed and swing plays out wide than about pounding runs into the line and passes over the middle. Given that, administrators at St. Thomas Aquinas, a private liberal arts college of roughly 2,200 students 15 miles north of New York City, said the benefits of fielding a squad outweighed the costs. They also saw sprint football as a safer alternative to conventional football, amid worries about brain injuries from repeated blows to the head. As insurance, the college’s athletic director, Gerry Oswald, also bought helmets equipped with sensors to alert trainers on the sideline when a player absorbed a big blow. That weight limit carries its own requirements and regimens. One morning in August, Lori Rahaim, the head athletic trainer, walked into the college library, set up equipment and addressed 63 members of the team. It was training camp, and Rahaim had to explain what she expected from them regarding everything from hygiene to hydration. When done, she issued an order. “In the library?” wideout James Hanigan said. The weigh-ins happen twice per week in season. The Spartans finished their first season with a 2-4 record. It was capped by a 33-12 loss to Mansfield University of Pennsylvania last Friday. It was a long way from four years ago, when Oswald raised the idea of bringing football to the college, where 54 percent of the students are female. Administrators considered the proposal, then set it aside. Margaret Fitzpatrick, the college’s president, later conferred with her colleagues at Chestnut Hill College, in Philadelphia, and Caldwell University, in New Jersey. Like St. Thomas, they compete at the Division II level in other sports. Fitzpatrick learned about their experiences with sprint football, and then gave Oswald the green light last year. “I had a program before I even had a football,” Oswald said. The Spartans gained admission to the Collegiate Sprint Football League, which governs the sport, in January. Barry, who was hired a few months earlier, hit the recruiting trail. His sprint football practices were conducted in nearby Tallman Mountain State Park while land was cleared on college property to make way for a 60-yard practice field across the street from a convent. Only one goal post was raised because if balls were kicked on the other end of the field, they would fly into electrical wires. Barry adjusted to the role of building from rock bottom. Barry, who had coached conventional football at several high schools, never watched a sprint game before taking the job. Games can be hard to find. There are only 10 teams that play sprint football at the college level. The College Sprint Football League traces its roots to the Eastern 150-Pound Football League, which was founded in 1938 in response to the increasing size of college football players at the time. Army, Navy, Cornell, Penn and Princeton were the original members, but the league, which doubled in size over the last decade, has gradually increased the allowable weight. In stepped the Spartans. Players came from Texas, Florida, North Carolina and Rhode Island to join teammates mostly from New York. Over the course of a few months, Joe Frias, a 6-foot lineman from Washington Heights, dropped from 260 pounds to 183 pounds and finally reached the required goal before the third game. Rahaim and Barry implored players to be healthy. To guard against players trying to sweat off extra pounds or purging, urine samples are taken and body fat percentages are examined. When Barry walked through the cafeteria during a recent lunch hour, players held up plates with chicken and broccoli. Some of the players said they came to the college specifically for the chance to play football, so one might say the program has already improved enrollment. Barry’s Spartans proved to be quick learners, or else they were simply good at football despite their size. In the opening game, at a home field 19 miles from campus, they rushed out to a 30-0 lead over Post University, of Waterbury, Conn., and won, 30-7, in front of 1,300 fans. Afterward, bagpipers from the Emerald Society serenaded Barry in the parking lot as his players stripped off gear inside a practice bubble that doubled as a locker room. The director of football operations ordered 90 pizzas to celebrate. When the pizza arrived, players debated whether to eat it. They knew they would have to weigh in again three days later. “Is there a healthier option?” quarterback Luke Sullivan said.